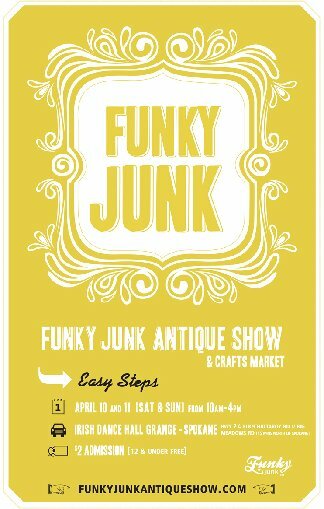 It's time to shower yourself with optimism and join us for a junking party like no other, the Funky Junk Antique Show! Irish Dance Hall Grange, just 15 minutes north of the Y in SPOKANE! Get there: take Hwy 2 North, turn right on Elk-Chattaroy Rd, veer right onto Big Meadows Rd and go 3 miles. Follow the Funky Junk signs and we'll meet you there! Train rides available for the little ones! Oh man, this looks awesome! How I wish I could be there...have fun! So excited about the prospect of being able to go to this! I will ask the other Mermaids too. Maybe will all swim on over!